India's Foreign Exchange Reserves On the Rise.. According to the weekly statistical supplement released by the Reserve Bank of India (RBI) on 9th September, 2016 India's foreign exchange reserves (FOREX) have continued to soar over the past couple of months and have now almost reached US$ 368 billion. Foreign currency assets, which includes the US dollar and other non US currencies, totalled US$ 342 billion, while gold reserves stood at US$ 21.6 billion. India's reserves have increased by US $ 5.1 billion from 22ndJuly, 2016 . 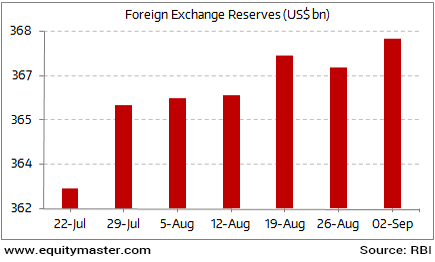 The reserves have gone up supported by strong dollar inflows which helped the central bank to add more dollars to its reserves to prepare for the FCNR outflows that are expected during the September-November time frame. The central bank had earlier stated that the FCNR deposits repayment could result in an estimated outflow of about US$ 20 billion. The central bank said that it would supply dollars to the markets in case there is extreme volatility but the market participants should not take this intervention for granted. The gradual mopping up dollars by the RBI looks like the central bank is taking no chances and has the ammunition i.e. the supply of dollars ready in case the markets require them.